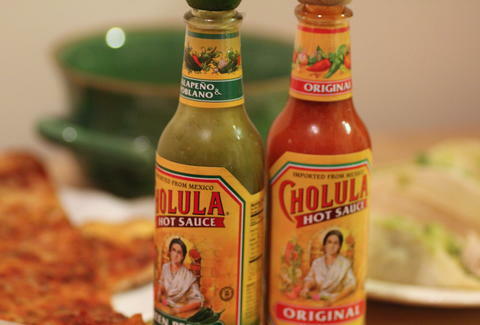 Is Cholula's new Green Pepper hot sauce better than the original? Our girl ‘lula has been spicing-up everything from nachos to mashed potatoes since she came North of the border in ’89, and, while she bares a saintly look of innocence, the mix of pequin & arbol peppers and vinegar packs a powerful -- but flavorful -- heat. Though we still love the Original, her zesty cousin is arriving from Jalisco in June. We got a bottle of the Green Pepper sauce to see how the jalapeño and poblano recipe stands up against the OG. Green Pepper: There's a quick spiciness that hits the tongue, but it's dulled out immediately by the tomato sauce and the flavor has no shot at penetrating the cheese and dough flavors. Even the aftertaste is nothing more than a slow heat that dies off. Original: It's also subtle, but this time, subtlety works. The flavors meld well, so I could enjoy the heat without the sharp, burning stabs at my taste buds that some sauces insist on bringing. 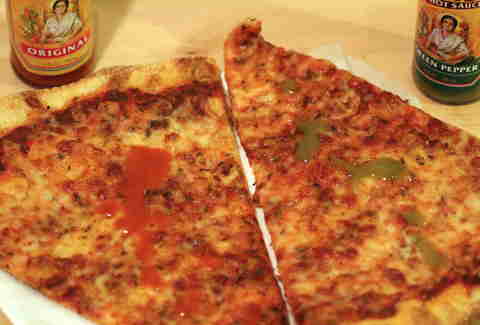 If I were suffering from short-term memory loss, I would not have realized there was hot sauce on the slice. 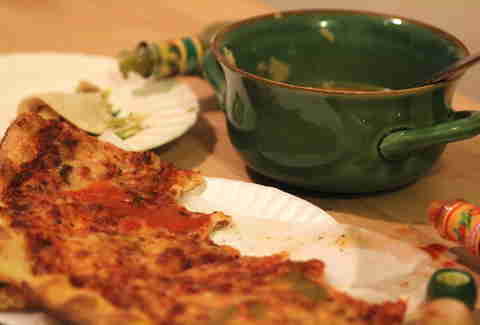 Winner: The Original brings heat and flavor without overpowering the pizza itself. Green Pepper: The sweetness of this sauce plays up the onions and gives flavor to the chicken, which is pretty plain on its own. Original: It gets points for spreadability but the flavor is totally lost -- and there's not much flavor in the taco to begin with. The spice does have staying power... but maybe that's because I'm starting to drown in Cholula at this point. 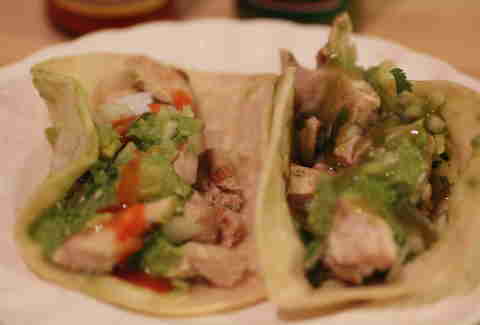 Winner: With a slightly bland taco, Green Pepper's abundant flavor is a clear improvement. Green Pepper: For a soup that's typically made with diced jalapeño, I thought this would work well, but the Green Pepper was actually overpowering in its sweetness. Original: In the soup, the red gal takes on the fiery flavor of a basic hot sauce... which means the actual flavors of the pequin and arbol peppers that Cholula prides itself for are totally lost, but it's still delicious. 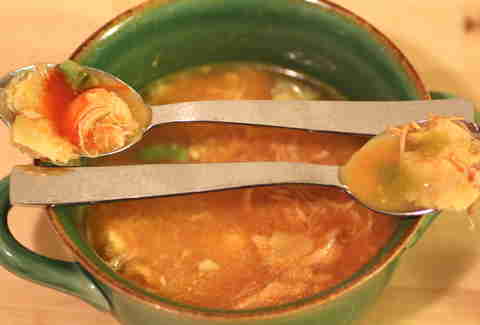 Winner: The Original manages to make a take-out soup oddly comforting and familiar. To be completely honest, I was never a Cholula fan before this taste-test -- and sampled solo, I still prefer the Green Pepper. But as a hot sauce, the OG was the clear winner and swayed me to its wooden-capped side. Its spreadability, more-potent heat, and vinegar base keep it a classic. The new kid on the block's poblanos and jalapeños complement each other flavor-wise, and there's a zesty sweetness that backs up the heat. And it's delicious. Grab the green girl for marinades or sauces -- its chunkiness and flavor profile are good for using in recipes, just not as a strict hot sauce -- but keep Cholula Original in the cabinet for a go-to sauce. Liz Childers may've just been seduced away from her standard bottle of Tobasco. Follow her to hot sauce unfaithfulness at @lizchilders1.